EE has announced its foray into the television market with the launch of its first set top box service dubbed EE TV. 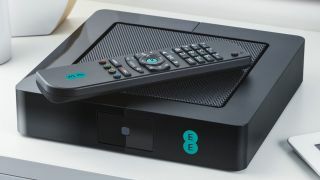 The box - made by Netgem - offers the full range of Freeview channels as well as a range of on-demand and catch-up TV services with the aid of EE's broadband connection. Controls such as pause, rewind and record are all present, and there's a whopping 1TB of storage (good for up to 600 hours of movies and TV) and 4 HD tuners allowing you to watch/record up to four different channels simultaneously. EE TV will be free for all EE mobile customers who already have or sign up to an EE Broadband plan, while eligible plans start from just £9.95 per month. Customers on existing pay monthly mobile plans who sign up for EE TV and home broadband will also receive a boost to their 4G data allowance, increasing to 10GB or 20GB depending on their plan. In terms of an EE TV release date, the network says it will be available "shortly" - which isn't overly helpful but you can expect it to land before Christmas. EE has packed in a series of features into its first set top box, the first of which is a digital remote control available on Android and iOS tablets and mobile phones. From this you can switch channels, control volume, play/pause/rewind, browse the guide and set and view your recordings. For those of you who still love an old school remote you'll be pleased to learn that one is also included in the box. With the multiscreen feature you'll be able to watch four different channels live on four difference devices (your main TV plus three additional mobile devices), which will hopefully put an end to some of those remote hogging arguments. Another useful feature is the ability to watch any recorded program on your tablet or smartphone, freeing up the TV for someone else. You will, however, have to be within your home's Wi-Fi network for EE TV to work. There is no offline option (so no downloading shows to watch on the plane, for example), and you can't go out and about and watch EE TV. Meanwhile Replay allows you to select your six favourite channels, and the EE TV box will have the last 24 hours of all six channels recorded on its hard drive, ensuring you don't miss your favourite shows. If you come home mid-way through your favourite show, and the channel is one of the six you've selected on Reply, you can instantly skip back to the start and watch it in full. You can move from the TV to your phone or tablet to finish watching elsewhere around the home, and if you fancy sticking it back on your main TV all you need to do is flick up on your device's screen.